.38 S&W LRN works in both pistols and lever-action rifles for sport and target shooting. The lead round nose bullet is perfect for shooting paper targets, while also being ideal for competitive shooting match traditions. .38 S&W ammunition is an old soldier of a cartridge, having been introduced in 1877. A relatively light-shooting caliber typically used today for target shooting, the .38 Smith and Wesson is used in a variety of classic revolvers like the Colt Police Positive, S&W Victory, and Webley Mk IV. 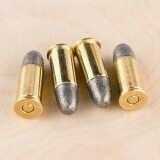 Range loads typically fire a relatively heavy 158 grain lead round nose bullet; one notable exception is the 145 grain full metal jacket load from Fiocchi, which can be shot at indoor ranges. For self-defense, options are limited but good as they include jacketed hollow point offerings from well-regarded companies like Winchester and Buffalo Bore. You'll find them all for sale here at Widener's when in-stock with fast shipping. Developed in 1877 for revolver use, the 38 S&W is a classic that is often hard to find. 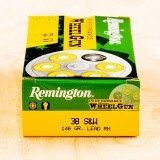 If you are looking to get your old wheel guns spinning, check out these rounds from Remington's Target line! Remington is the oldest ammunition and firearms manufacturer in America and still produces both in the USA. 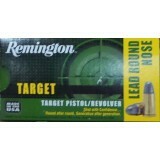 These Remington Target cartridges are designed to be reliable and affordable for high volume shooting at the range. 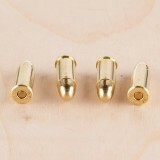 Each round fires a 146 grain lead round nose bullet at 685 feet per second. Remington utilizes brass cases and non-corrosive boxer primers. Owners of .38 S&W revolvers will enjoy the dependable accuracy of this .38 Smith & Wesson ammo from Remington's Performance Wheel Gun series. 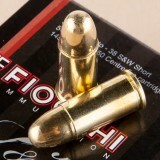 This ammunition can be used for simple target shooting as well as cowboy action matches. It uses a light kicking powder charge that enables the user to recover more quickly between shots. This promotes rapid, accurate fire at close range. 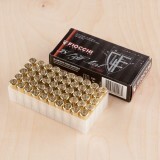 Each cartridge in this box of 50 fires a 146 grain lead round nose bullet at a muzzle velocity of 668 feet per second. Note that lead nosed bullets may not be allowed at some indoor ranges. 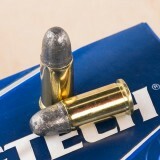 Conversely, these projectiles are ideal for shooting steel targets! Remington Performance Wheel Gun ammo is loaded in Lonoke, Arkansas using non corrosive Boxer primers and reloadable brass cases. Established in the early 19th century, Remington is one of only a few companies making both arms and ammunition in-house. 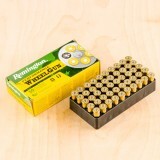 If you own a handgun that uses .38 S&W cartridges, you can get the ammo you need for target shooting, competitions, and general plinking by ordering this 50-round box from Magtech. You’ll have 146-grain lead round nose cartridges that are fast and effective, allowing you to get the practice you need at an affordable price. With a high-quality case and reliable primers and powder, these rounds will deliver the precision you desire. 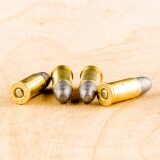 With a muzzle velocity of 686 feet per second and a muzzle energy of 153 foot pounds, these rounds are excellent for short to medium-range target shooting. Even at 100 yards, they still maintain a velocity of 618 feet per second and an energy of 124 foot pounds. 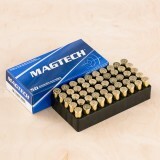 Magtech is dedicated to providing world-class ammunition for a wide range of purposes. This company, which is part of the CBC Group, has training, hunting, and self-defense rounds for most popular calibers. 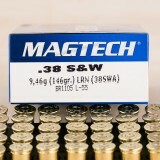 Can't get .38 S&W ammunition locally? Never fear, Widener's has you covered! 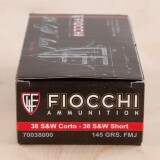 These .38 S&W (not to be confused with .38 Super or .38 Special) cartridges from Fiocchi deliver good accuracy at a reasonable price. 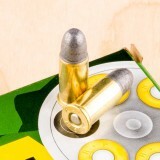 Each round in this box of 50 fires a 145 grain full metal jacket bullet at 780 feet per second. Unlike lead round nose loads, this ammo is generally welcome at all indoor ranges. This ammo is made in Italy using non-corrosive Boxer primers and reloadable brass cases.